This beach home is located in our quietest building set among the surrounding pine forest. The beach is located just a short walk from your front doors and pet owners will love the ease of taking the dog for a walk from this ground floor unit. The large dining room table provides the perfect setting for family meals or games. The large kitchen is well stocked and functions well for multiple chefs. It overlooks the living room and dining room so you are always part of the conversation. The master bedroom has its own private bathroom including jetted tub and separate vanity. Sports court and playground are just a short distance away. We stayed at 1315 vacations by the sea for one night. It was a spacious unit for two couples and two dogs. The kitchen had everything you'd need to cook meals (including a cutting board). One thing to note is that in the winter, the outdoor hoses are shut off, so we weren't able to rinse off clamming gear there. We’ve stayed in this condo before and really enjoyed the unit. Everything you needed to have meals was supplied in the kitchen. The bedrooms and bathrooms were exceptionally nice. We couldn’t get the DVR to work so that was a little disappointing as one of us had rented movies to bring along. Very handy condo with having two dogs with us. Condo was big, comfy & clean; beautiful kitchen. A few maintenance issues but I’m sure they got ironed out. Great end unit & best of all -pet friendly! Overall a good unit & would rent it again. Arrived to find a well outfitted condo, as usual, spent a great week relaxing, beach play, sun and fun in the sand. Beautiful weather and comfortable condo too, can't ask for much more. The unit was set back further than other condos we've stayed at before, but was convent and easy with a little one and a dog. We wish the office still had dvd foe the units and towels for the pool, or that it was better explained to us. The unit was clean but could use some updating. We had a great time. Very nice condo perfect for 2 couples with our 2 dogs. Maybe a cutting board would be nice but otherwise everything we needed was in the kitchen. It would have been nice to stay more than 2 nights especially to get away from the heat! It was a wonderful experience. We arrived to a beautiful condo that was clean and had everything we would need for our5 night stay. We had 40 family members who came to help our father celebrate his 90th birthday. We all had our own space where we could gather together or go our separate ways. It was wonderful! We had a wonderful, sunny Thanksgiving weekend and enjoyed long beach walks and great meals! The kitchen was fully stocked with everything we needed (even a gravy boat!) and we loved the easy access to the beach from this ground-floor unit. Everything about this trip was easy and relaxing. Excellent stay! The condo unit was fantastic, homey, clean and comfortable. Sadly we had two problems. When I booked online it looked like we had our desired 5 nights. When I called staff asking for a 6th night they said it was booked. I assumed all was well and didn't read the details emailed to me. We ended up making a stressful, rushed departure after 4 nights. In addition we had a problem with noisy drunks staying above us. After reporting the problem the first night, security hushed them but not until 1 a.m. It was an excellent experience. We stayed 3 nights with our teenage girls and 2 dogs. The unit was spacious, we'll cared for and the facility was awesome? we had so much fun walking on the beach and collecting seashells! Have stayed at Vacations by the Sea many times and its always wonderful. This condo is better for families/dogs because its on the ground floor and the front door faces toward the playground area. Easier ins/outs for the kids. It's a toss up between choosing this one or the ones with a better view, but its always a good time. Spectacular stay! Huge rooms, we were amazed by the open space in this condo. The full kitchen with eating bar and granite counter-tops mad meals a joy. 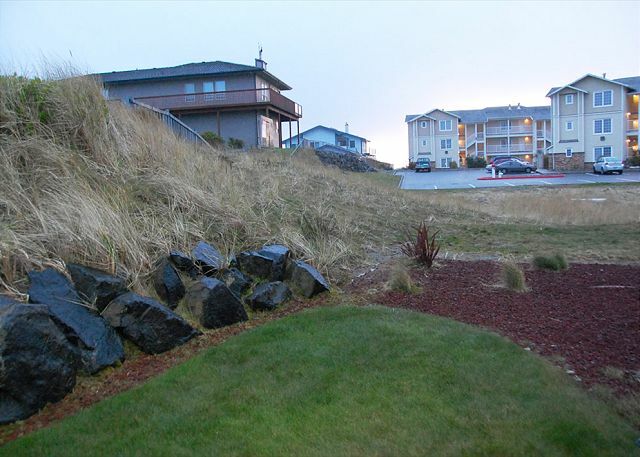 Just a short, easy walk to the beach, just walk out the patio door and across the parking lot to the trail through the grassy dunes. The amenities are astounding, gym, entertainment room and the heated pool with hot tub, made our grey day full of fun. What a beautiful property. Well maintained, excellent facilities, and great staff. Price for a condo was very reasonable. An excellent place to enjoy a long weekend at the beach. So glad to hear you had a great experience, we hope to see you and your family again soon. We really enjoyed our stay at Vacations by The Sea. Its close to the beach, and our unit was in great condition. We plan to stay there again on future trips to Westport. Our little "Countrys Band" really enjoyed ourselves! We were in town to play the Rusty Scupper Festival, and they put us up in your fine establishment! We were living pretty "high on the hog!" We even took a good late night walk on the beach! Love the location! Thanks for coming out for the Pirate Daze Festival this past weekend and we're glad you enjoyed the condo. We are local sponsors of this great festival and donate several condos each year for the announcer and bands. Hope to see you again down the road and thanks for the great entertainment! Family came to the beach for two weeks of great weather. This unit is well positioned for the pool and play area. Kitchen is well equipped. Lots of floor space. Cozy view of wooded area with a very short walk to the beach. Good unit for pets. A "must stay" location. Don't pass this wonderful experience up.